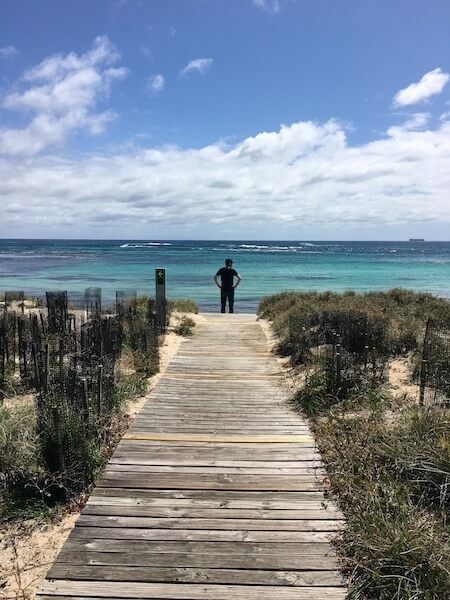 Located only 19km off the coast of Fremantle in Western Australia, Rottnest Island was a place I really wanted to visit as part of the Western Australian portion of our 10-month road trip. I was as giddy as a schoolgirl the morning of our adventure. 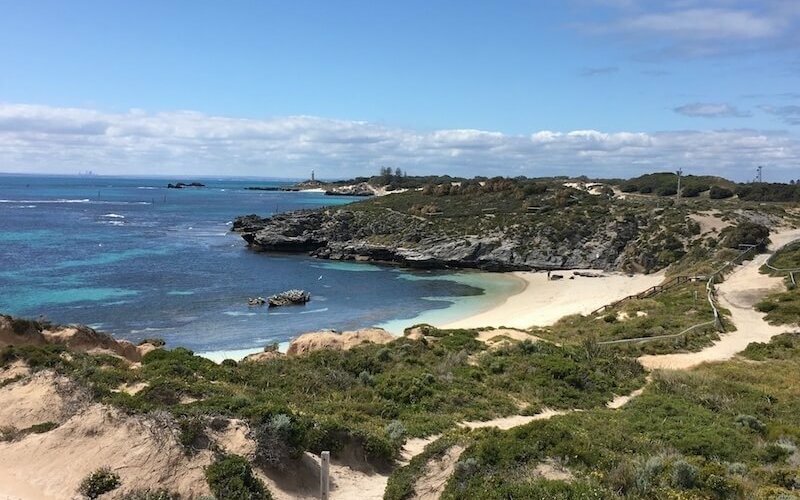 Visiting Rottnest, or Rotto as the locals affectionately like to call it, is like entering another world. A world where life is slower. Where transport around the island is by bicycle or on foot. Where people wander. Where kids play without worry of traffic or crowds. Where the days are savoured. Rotto is a place where life is enjoyed. Every single second of it. Rottnest Island has worn many hats in its evolving story. The indigenous aboriginals walked the land more than 6500 years ago, perhaps even longer, when the land mass was still accessible from the mainland. They were not a seafaring people, so when rising sea levels seperated the Island from the mainland, the locals adapted to the change and remained inland. It was not until the late 17th Century did the Europeans arrive, aboard the Dutch ship Vergulde Draek. The Europeans explored the area for over 100 years before settlement began in 1829, this time by the British. Settlers from the Swan River Colony (now Perth) eyed the Island as an opportunity to farm, fish, and harvest salt from the salt lakes that exist here. Not long after the Island was settled, it was decided that it should be used as a prison for the Aboriginal People. Similar to the plight of those sent to the penal colonies of Eastern Australia for the pettiest of offenses from Brittain, so too was the fate of indigenous boys and men up 70 years old, sent to Rottnest. To the indigenous, Rottnest Island was a place of spirits, forbidden for them to enter, so their incarceration was made that much worse for them. The prisoners were responsible for building the roads and other building projects on the Island, a task that continued until 1931, 25 years after the prison was officially closed. While this was going on, in 1848, the Governor of Western Australia, thought that the Island would make an ideal escape, so it became the exclusive summer retreat for him and his friends. This trend continued for the next 75 years. In the meantime, the Western Australian government opened a Boys’ Reformotory in 1881 for young boys who made trouble for the law (see a pattern here?). The barracks for the Boys, as well as the Governor’s Mansion, were later converted for recreational use. Of course, Rottnest Island has a distinct maritime history as well. More than 13 shipwrecks have occured surrounding its rocky reef system. The Swan River Colony heavily relied an shipments into Fremantle so a Pilot Service was introduced in 1848 to help ships to navigate the treacherous waters. The prisoners of the Island were additionally tasked with the construction of the Island’s first lighthouse, completed in 1851. The majority of the Island’s history since involves recreational use. Its stunning beaches and bays provide a fantastic opportunity for swimming, snorkeling, and diving and thus brings us to present day. Unless you have a rich relative who owns a boat, the best experience on reaching Rottnest is to take a ferry. You can fly, but you miss out on half the fun. After extensive research, we chose to work with the ferry service with the best reputation: Rottnest Express. 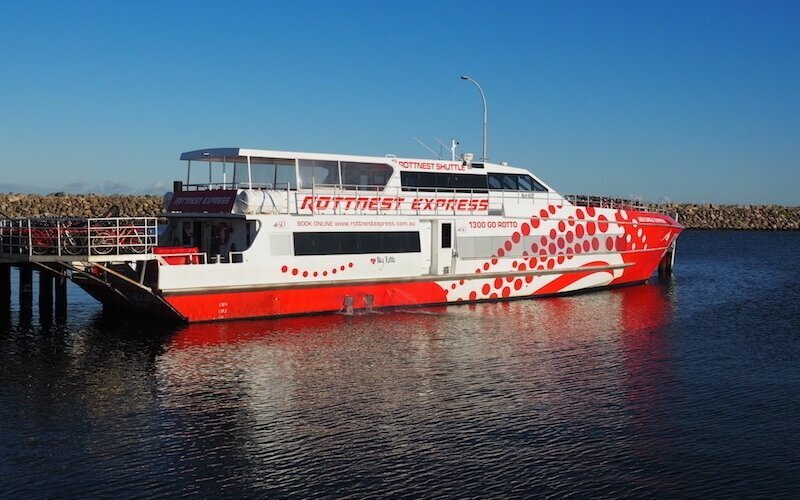 The Rottnest Express ferry departs from Elizabeth Quay in the city centre of Perth and from two Fremantle marinas: Northport at Rous Head and B-Shed in North Fremantle. Parking wise, Northport offers the best option with over 400 parking bays and is secure. The lot is open though, rather than being undercover so your car is exposed to the elements. If you have a campervan or the like, or a Thule cargo pod mounted on your car as we do, height tends to be an issue but Northport offers the best solution to account for this. Best of all, Northport offers easy access to unload bags and bikes, more than at any other ferry terminal. Rates are about $12/day. There is no parking at Elizabeth Quay (but good for those who are staying at a hotel in the city). Rottnest Express does offer a free metropolitan hotel pick up service. Click here for more information. Parking at B-Shed at Victoria Quay is limited and parking around E-Shed, where the ferry terminal is in front of, is limited to 3-hour parking. There is long term parking at Victoria Quay near C and D sheds, but it’s not undercover nor is it secure. It’s also a popular spot so you have to get in early, if you get parking there at all. Rates are generally $10 per day in this lot, which is cheaper for the day than any other. If you plan on staying on the island overnight, and there are many options for accommodation, but you need to check your bags before boarding the ferry. Luggage, even an overnight bag, are stored in a special luggage cage on the ferry. You can take your own bikes, boogie boards and the like as well, but those are extra. Rotto is an outdoor playground. You could spend a day and see the highlights, as we did, riding the entire island, or you could spend a week or a month hanging out, enjoying the slow pace and have an amazing holiday. I think I said out loud a few times that I could see spending a month here, writing. I could imagine finding a nice spot to stay on the island, enjoying a lovely walk in the morning, a little snorkelling in the afternoon and still have time to write to my heart’s content when I’m inspired. That was not this trip for us though. This was to get a taste. A taste because I will return one day for the degustation menu. It was a day trip and what an amazing day it was! Probably one of my favourite experiences of our entire road trip to date. You can read more about our day here as the purpose of this post is to provide information. I won’t lie. I’m not a cyclist, but a meandering ride around an island that totals 19 square kms is my kind of bike ride. A day isn’t enough. I will return for sure. There are no vehicles on Rottnest with the exception of service vehicles and buses. Biking is definitely the way to go. Bikes can be rented when buying your ferry ticket. The ferry transports the bikes from their depot to the island and when you disembark the ferry, you line up to collect your bike and helmet there and then, and do the opposite before re-boarding the ferry. It’s super easy and very convenient. Once you have your bike, you’re ready to explore. The Rottnest Visitor Information Centre is at the end of the pier, so stop, pick up your map, refill your water bottle and off you go. But what if you’re not coordinated enough to ride a bike? Or if you don’t have the capacity to ride? There are electric bikes for rent. 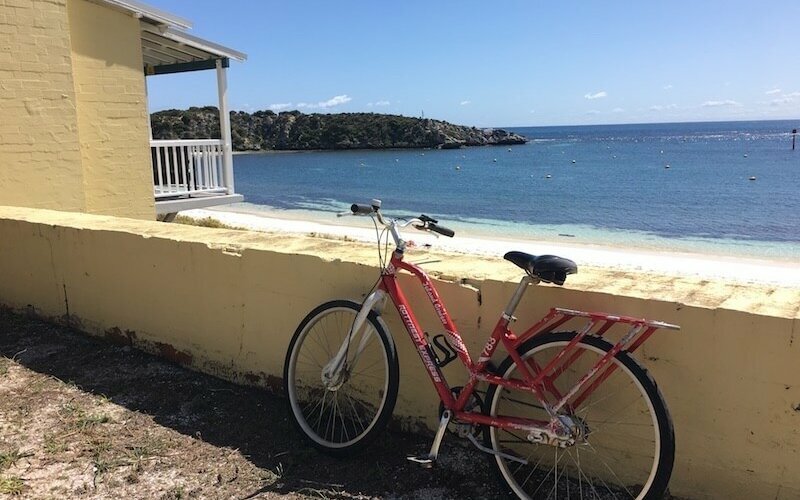 Electric bikes can be hired from Rottnest Island Pedal and Flipper. 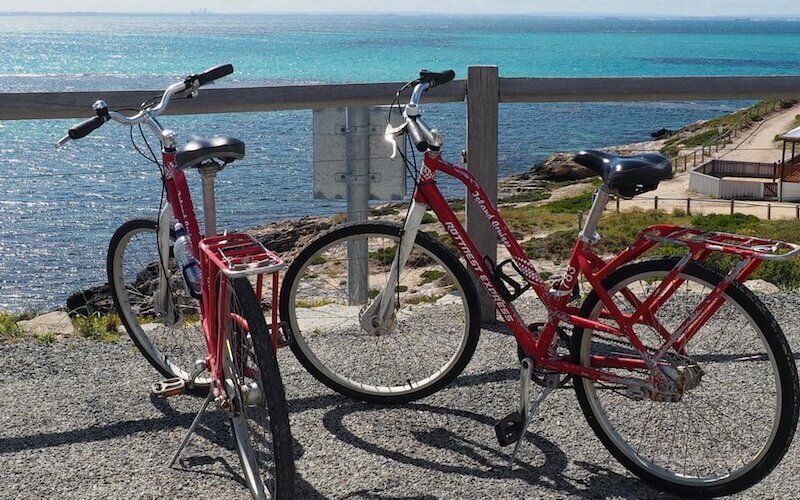 Reservations are separate from ferry bookings and done through Rottnest Island Pedal and Flipper. You can hire a variety of bikes from here, such as tandems and with child seats/or child cargo trainer, but you have to pay a bond with each hire. For an electric bike, it is a $200 bond and $60/one day. It’s cheaper the longer you hire and you have to be 18 years or older to hire one. There were times I wished for an electric bike. Toward the end of the day, when our legs were jelly and we were tuckered out because we’d not packed enough water (see my ‘Things to Know’ Section), I was overtaken on the road by a 70+ year old man.The words I thought at the time should not be repeated here, but I was speechless that someone 25 years older that I, could overtake me at this hilly juncture. Then I saw he was riding an electric bike. He was pedalling, but it was all for show. Maybe it was the exercise he needed to keep his bowel movements regular (apparently biking helps with constipation)? I don’t know, but he was riding an electric bike and leaving me in the dust. Truth be known, I was green with envy as I struggled to make it up the next long, slow hill. But don’t worry, there aren’t many of those – hills, that is – on Rottnest. Just enough to keep things interesting. There is also a bus option. There is a Island Explorer hop on/off option that costs $20 (adult) for a day. There are lots of bus stops along the way, and if you’re short on time, this would be the way to go. There’s also an island shuttle, or what is essentially the accommodation shuttle bus. But, if you wanted to walk part of it, you could get the shuttle back to the Thomson Bay Settlement after your walk. The cost is $3 per day but it only goes so far as the accommodation settlements, not to the far end of the island. 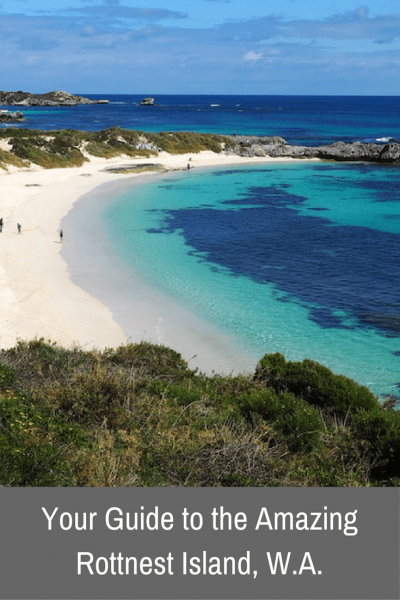 What are the recommended places to see on Rottnest? If you don’t have a lot of time, there are some places on Rottnest I think are must dos. Once you’ve left the Settlement, and still want for ‘wow’ factor, head to Bathurst Lighthouse. The Basin, with its shallow clear waters, is only 10 minutes walk from the Thomson Bay Settlement. It is an underwater snorkelling playground and the water is such an amazing blue colour you will rarely see anywhere else in the world. Even in cool weather, this is the perfect spot to dip your toes in the sand as you inhale island life. Cathedral Rocks is a must see, to view the N.Z. Fur Seals. You could spend a while here as they are pretty entertaining. West End. it’s like visiting the end of the world. You feel that at West End. It’s rough seas, blowing winds and battered rocks. It’s fresh sea air and freedom and vastness. 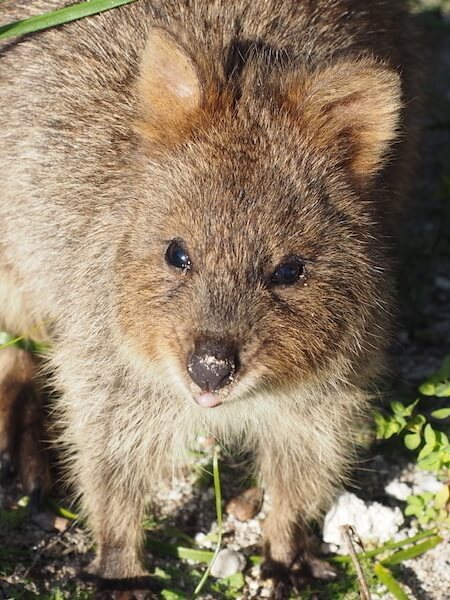 It’s possible to stay on Rottnest for a night, a week or, if you can afford it, a month. It’s not a cheap destination but it’s an experience I think everyone visiting Rottnest should experience at least once in their life. A Living List item as it were. Options vary from premium accommodation in hotels and historic homes, to basic barrack-style options and camping. What surprised me most was the amount of standard self-contained accommodation that were available. But it didn’t surprise me how popular these are. If you do stay, it’s recommended your bring groceries to the island, as there is only one general store and as you can imagine, it’s island prices. But they are competitive for things like milk, bread etc. in case you run out. Costs: Costs start at $38 for a campsite and continue upwards of $500 a night, depending on views, type of accommodation and availability. Click here for the latest on accommodation. I found this site a bit confusing honestly, so to see what accommodation is actually available for your dates, go here. There are only two places to find food on Rottnest: Within the Thomson Bay Settlement and the Geordie’s Café in the Geordie Bay area. The Settlement’s position at one end of the island, near the ferry terminal and marina, make it convenient to start or end your day in one of their dining establishments. If you are staying longer than the day, the shuttle bus allows you to stay in other accommodation areas and still get into the Settlement, but check the bus schedule. Dome: Providing coffee and a varied menu. You can’t miss it. The place is huge. The Lane Cafe: Speciality coffee, but limited hours. Bummer. 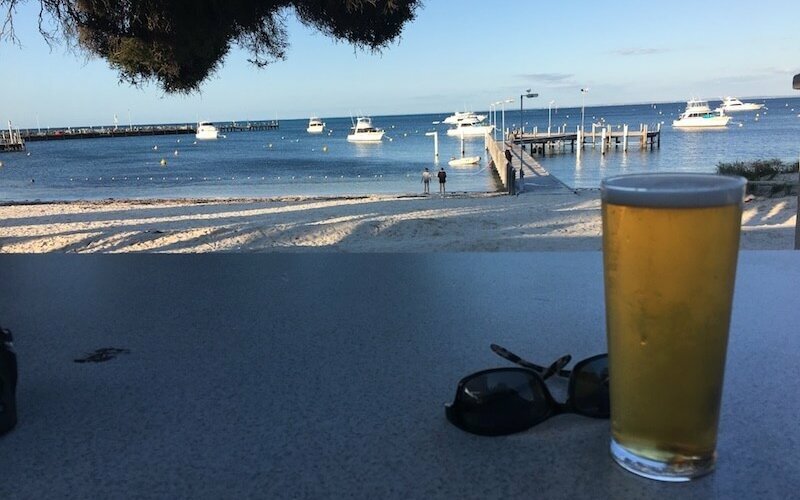 Rottnest Island Hotel: From appetisers to pizzas to full pub fare. The best part? The amazing view. Find a seat outside and take it all in. Subway: Eat fresh. Need I say more? Good to pickup for lunch later when you want to explore the island on your bike. Rottnest Bakery: Fresh wild flour bread baked-daily on the premises using local ingredients, organic meat pies and delicious jam and cream donuts. Cold drinks, coffee and gelati are also available. Bakery hours. Rottnest General Store: Picnic items galore. Simmos Ice Cream: We were eager, but when we finished our ride around 4pm, it was already closed. The crazy part? It was during school holidays so we expected it to be open!! We were bummed because it was voted in The Top 15 Ice Creameries in the World by USA Today. Here are the things we learned while visiting and things we think are just practical things to know. Take water. At least two bottles per person. There are bike mounts for water bottles but carry more with you. Water refill stations are scarce so refill every time you see a drinking water option. There is one drinking water fountain near the Tourist Information Centre and one at [x]. Don’t fill your water from bathrooms as they it is not potable water. There is no water at West End either. Wear sunscreen, no matter what the weather. The sun is brutal in this part of the country. Slip on a long sleeve shirt, slop on the sunscreen and slap on a hat if you’re not bike riding. Better yet, where a baseball hat under the bike helmet and be sure to wear a shirt also has a collar. Even in September, it was cold on the ferry but riding around the island, we were wearing T-shirts. There is a locker option at the ferry terminal behind the Tourist Information Centre. If you do as we did and leave on the earliest ferry, store your jackets in a locker, so you aren’t lugging them around all day (like we, stupidly, did!). They aren’t large lockers, but they will store jackets, hats etc easily for the day. If you are snorkelling, you can take your snorkel gear to the island with you. Alternatively, you can rent gear when booking your ferry tickets. Just don’t snorkel where the seals hang out on the south end of the island. Seals equal sharks and we’re talking the Great White variety. There are a lot of sheltered bays that have reef shelves protecting them from deeper waters which are safer to snorkel in. You don’t have to go out very far to reach amazing marine life. You also don’t have to be super fit to bike the island but you have to have some level of fitness, if you plan on seeing it all in one day or if you plan to ride to West End. There are always electric bikes on offer too, as I mentioned. I wouldn’t recommend little ones doing it – it’s about a 20km round trip but I did see some parents with child carriers hooked on to their bikes. Keen beans, I thought. I’d suggest waiting until the kiddies are big enough to pedal under their own steam and then make sure they can go the distance. If you are on a budget, pack your own lunch (and breakfast too if you’re heading to the island on the first ferry of the day.) Dinner is cheap enough to split a pizza or something light at the Rottnest Hotel or to split a Subway sandwich, something you can do before heading back to the mainland. Sitting enjoy a beer and pizza at the end of the day while the sun goes down, waiting for the evening ferry, is totally recommended. 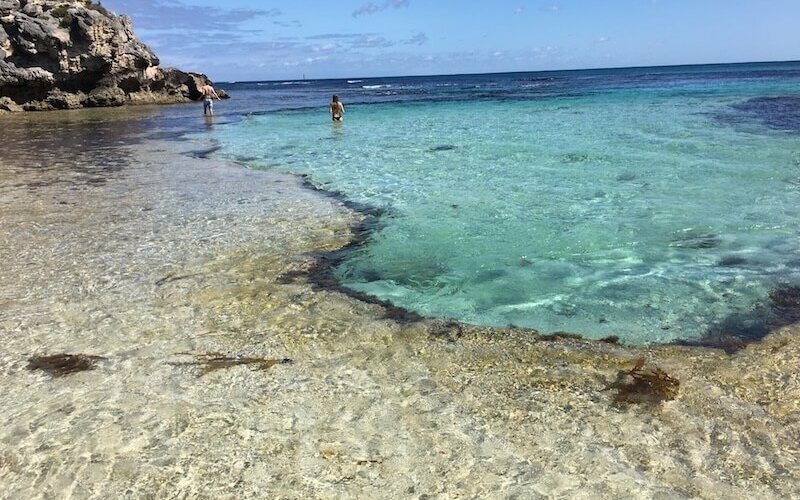 If you’d like to read about our day at Rottnest, you can find the post here: A September Day on Rottnest Island. A huge thank you to Rottnest Express for sponsoring our exploration of Rottnest Island. Thanks Ruth! Happy to know you enjoyed it and know you’ll have an amazing time, no matter what time of year you go. I am ready to go back! Nice post. Thanks for sharing your travel experience. Rottnest is an amazing place for the vacation trip. 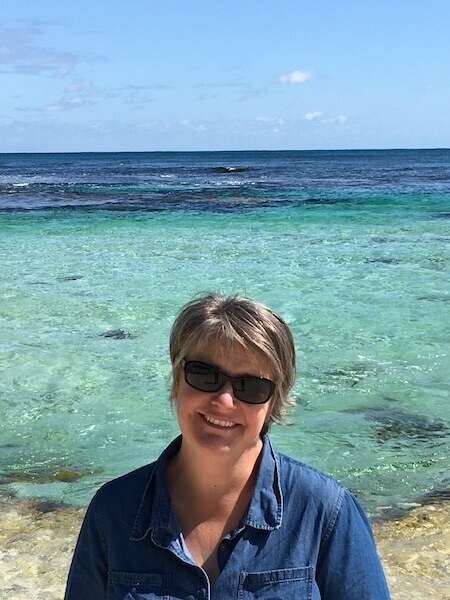 I am very much excited to go for my Rottnest trip with my partner. We got a hotel Goflya.com for our trip. Now ready to go.